BSM stickers are popping up all over! If you have one already, send me a photo of where you’ve stuck it. If you would like a BSM sticker, please contact me with your mailing address! Me, the BSM, and one of my braveskisons…high atop Alta after a sweaty, 15 minute bootpack! December 10, 2011. Two more BSMs in Oregon! A Pennsylvania mom and child at Beaver Creek, Colorado. February 2012. More Retallack Snowcat Love! February 2012. At the Phoenix, Arizona airport. Patrick, a proud New Orleans native, shares the BSM sticker LOVE at Aspen. Thanks! In the Sitzmark Bar at Alta Lodge. Brave Ski Moms Linda, Lisa and Dixie on the Mount Hood Meadows, OR ski bus. Brave Ski Mom sighting at Winter Park. February 2013. And a Revelstoke close up. Proud to be with other Coloradans — Monarch Mountain Resort and Flylow. BSM Ruth at Aleyska, AK! 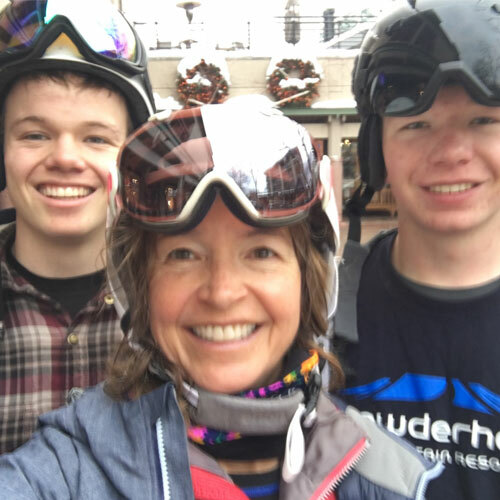 Becky has two loves: skiing with her family and the Brighton Resort youth ski team! Brave Ski Mom sticker proudly displayed on the door of the Great Divide Ski Team building, near Helena, Montana. Heather Gardiner, a Big White Brave Ski Mom! And another one from Big White, BC! As seen at Welch Village, Minnesota. In the “Penalty Box” at the top of Big Sky!